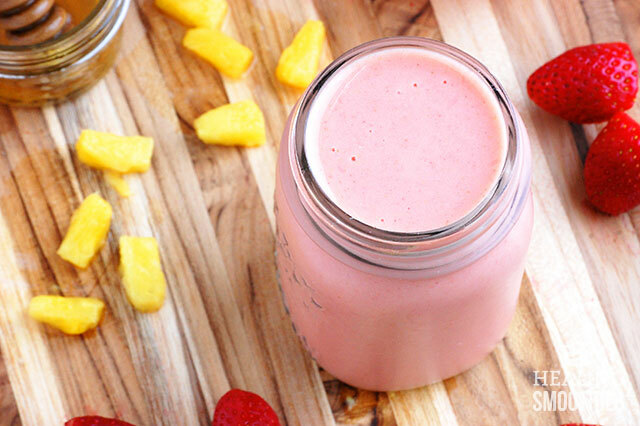 This strawberry pineapple smoothie is packed with bright citrus flavor. It is a delicious and tasty way to boost your immune health. Make it any time of day to replenish and restore your vitamin C levels. 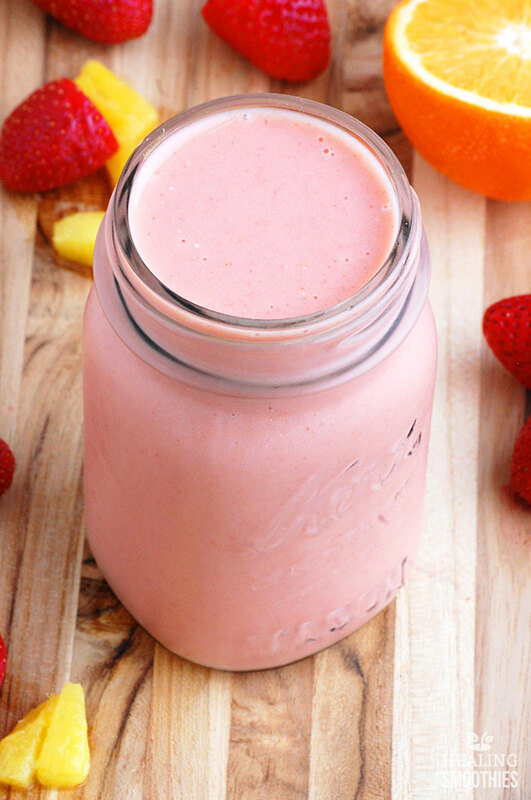 The strawberries, pineapple, and orange juice in this smoothie will all provide you with a huge burst of vitamin C. This vitamin is vital for strengthening immune health. 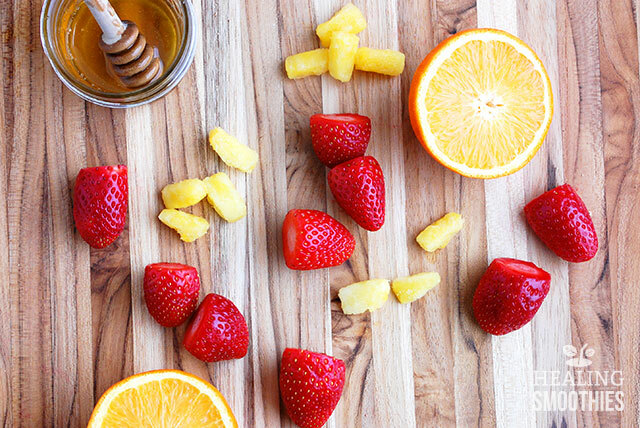 Just one cup of strawberries meets the daily requirement for vitamin C, but in this recipe you get even more vitamin C from the orange juice and pineapple! Vitamin C has antioxidant capabilities and fights against damaging free radicals. This prevents cell damage and reduces the risk of cancer.The vitamin is also good for your skin and bones by helping with the production of collagen and repairing tissue. Along with vitamin C, strawberries and pineapples team up to give you plenty of fiber and manganese. Fiber aids in proper digestion and lowers cholesterol levels. Manganese, on the other hand, develops strong bones and tissue. This smoothie has almost the entire daily recommended intake for the mineral. On their own, the sweet strawberries in this smoothie contain the antioxidant anthocyanin, which protects against cancer and tumor growth. Strawberries are rich in B vitamins as well. Folate is a particularly important B vitamin needed for cell growth and repair. Furthermore, strawberries supply smaller amounts of potassium and ellagic acid. The other main fruit in this smoothie contains a unique enzyme. Pineapples are a good source of bromelain, which reduces inflammation and may help alleviate joint pain. Additionally, the enzyme may prevent the growth of tumors and slow blood clotting, so you can see how it is an important quality of the tropical fruit. Whenever you are feeling under the weather, whip up this healthy fruit smoothie to help out your immune system. The taste will be very citrusy unless you decide to add in some honey. Start with a small amount of sweetener because you can always blend in more. 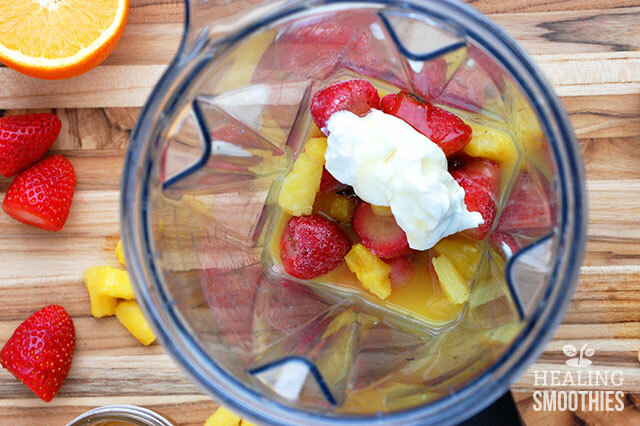 Either way, this smoothie will be sure to wake up your taste buds! 1. In a large cup (if using an immersion blender) or a blender, combine ingredients and blend until smooth. Add cold water if necessary to reach desired consistency. Serve immediately.